A Bit Backward . . .: Family Fun, Food, and Rocket Launching! Family Fun, Food, and Rocket Launching! Your pizza looks amazing! Thanks for the recipe link too. Good luck with the GRE. Miss you guys! Mmm, that looks so YUMMY! We will have to make it! I didn't know you wanted to do a Graduates in English. That's neat! You always make such yummy food!!! When are you going to Disney Land! Looks like you guys had a lot of yummy fun. Thanks for the recipe, I'll definitely give this one a try. It looks like you guys had a lot of fun. Have a great time in Disneyland!! Good cookin and eating and fun! When you guys get a chance travel up to Canada to visit us ok??? 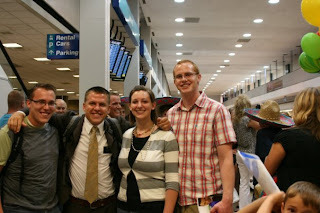 We are leaving to go to CA on the 21st of August, and we will come back to Provo by the 27th. We are so excited!! Especially since Squire has never been to Disneyland before!! Awww! Squire's never been to Disneyland? Have FUN!!!! It'll be awesome! Cool rocketlauncher and all of this food is seriously making me hungry!